"This recipe belonged to my mother. It is one the many cookies from her Christmas cookie collection." In a medium bowl, cream together the butter and sugar. Add the vanilla and egg yolk; mix until fluffy. Stir in the flour, and refrigerate dough for 2 hours. Preheat oven to 300 degrees F ( 150 degrees C ). Grease cookie sheets. Measure out the dough by teaspoonfuls, and roll into balls. Dip the balls into chopped almonds and set on the prepared cookie sheet 1 inch apart. 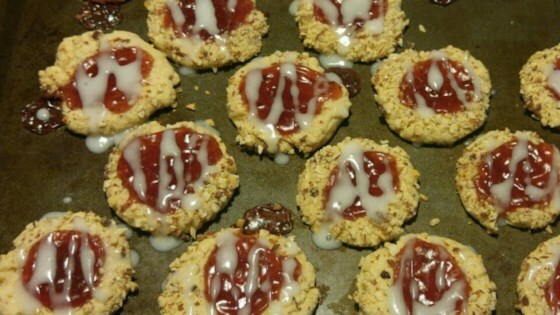 With a finger, make an indention in each cookie, fill the indention up with jam using a teaspoon or a pastry bag. Bake in the preheated oven for 15 to 20 minutes, cookies should be golden brown. Remove from pan after baking to cool on a wire rack.